Try the burn tool..this is just a very quick example..
Never get between a teenager and his favourite soup! lol, very good Totte.. he's here all week ladies and gentlemen! Could have been Finnish summer soup too, vodka in a flowery bowl, and that the Finns do kill for. Grass soup???!!!! Color me confused!! Grass soup???!!!! Color me confused! !Soup de gras as in 'coup de gras', meaning a death blow. Soup de gras as in 'coup de gras', meaning a death blow. Ooooooh like my mother's cooking !! I get it !! Sorry work has been sucky and I'm being sappy !! Remind me to politely decline any invitations to dinner. 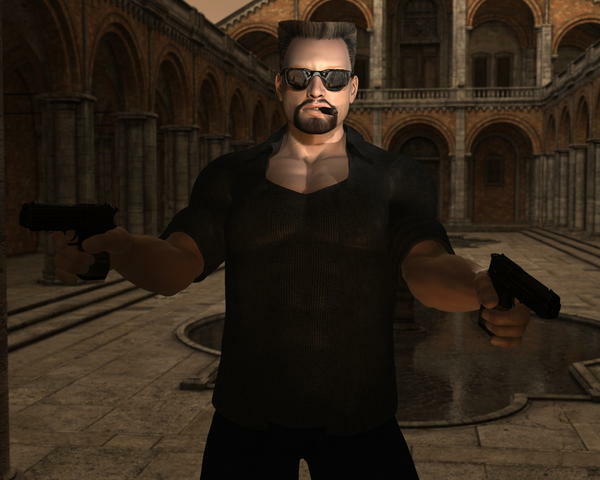 Quick test-render of Freak 5 (at 62%) wearing one of the Last Gladiator textures, Flat Top Hair, and Hitman. Set is Jack's West Park Ablutions -- can't deny it's perfect for this! DS4.5Pro render, postwork in GIMP. Larger version in my deviantART gallery here. Just downloading it - was a nice surprise seeing you doing also something of this kind, looks cool! Just LOVE IT! I am always so so so so thrilled to see another fantastic set ! and this is perfect for a scene that I was wor king on that needed a mor classic style! Thank yoU!!!! !